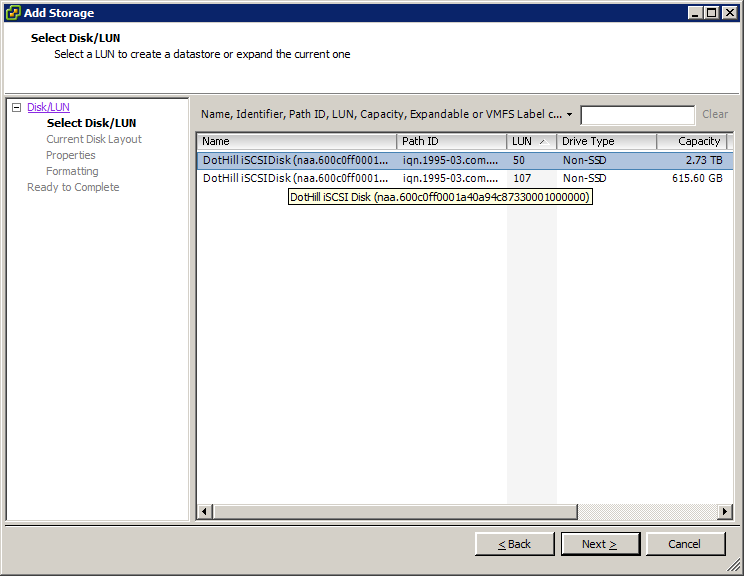 Some servers, however, still have traditional disks as in the screenshot below where clearly see the HP Serial Attached SCSI Disk, A.K.A. 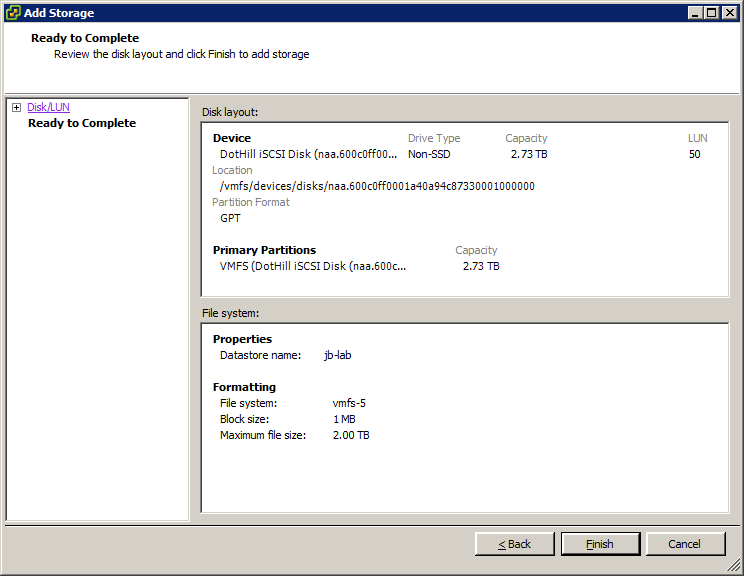 “Local Storage” or “Directly Attached Storage,” but no other storage is listed. 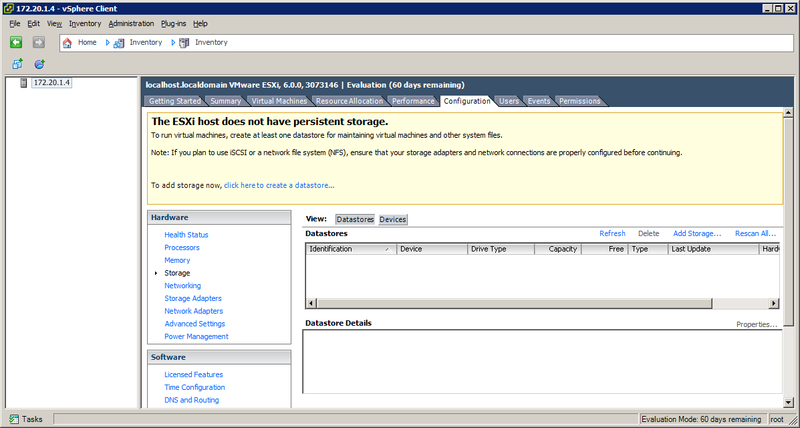 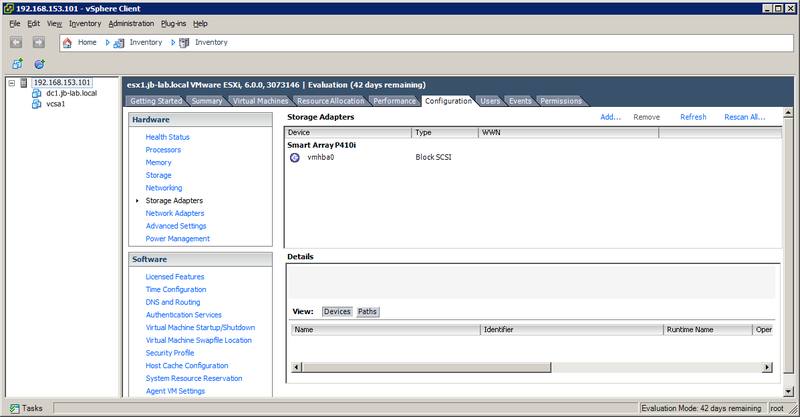 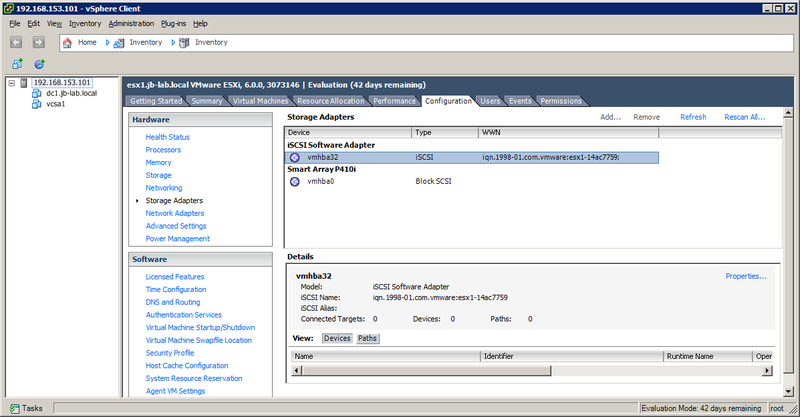 In either case, it should be noted that it is a Best Practice, when installing ESXi to disk or media, to use a RAID 1 configuration for the location of the ESXi installation. 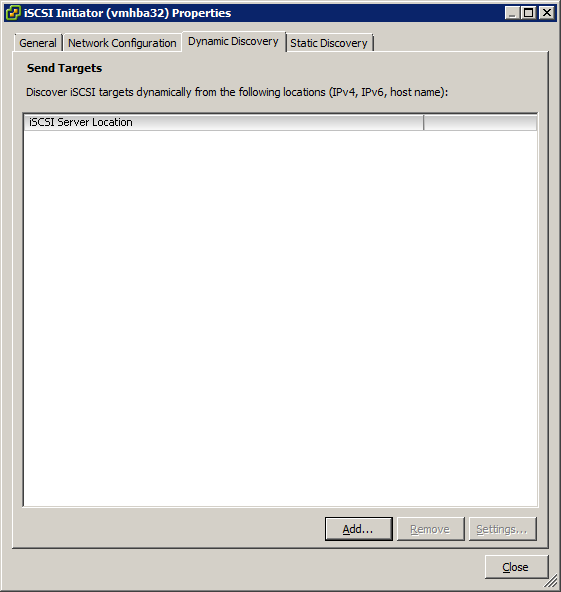 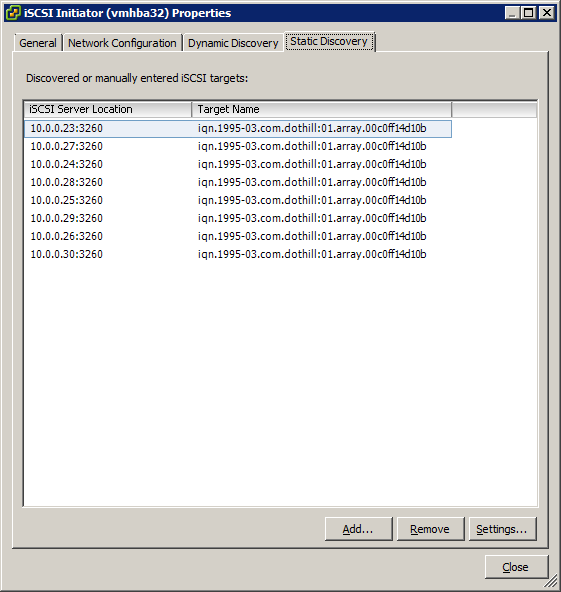 Our first task will be creating a network for iSCSI storage traffic. 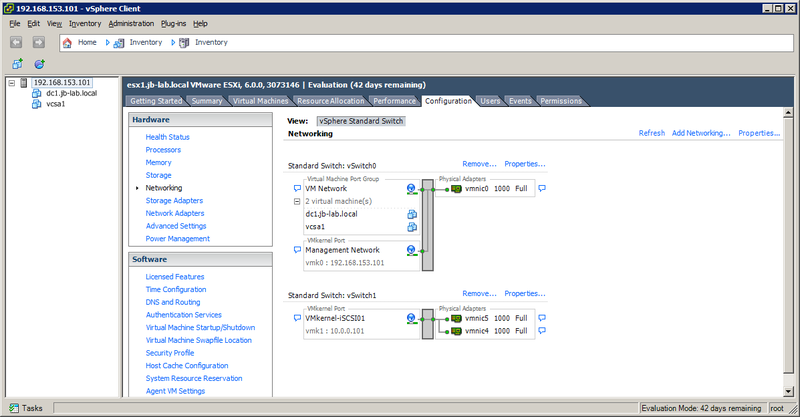 This should be a completely separate network from Production or Management networks, but how you create the separation is entirely up to you. 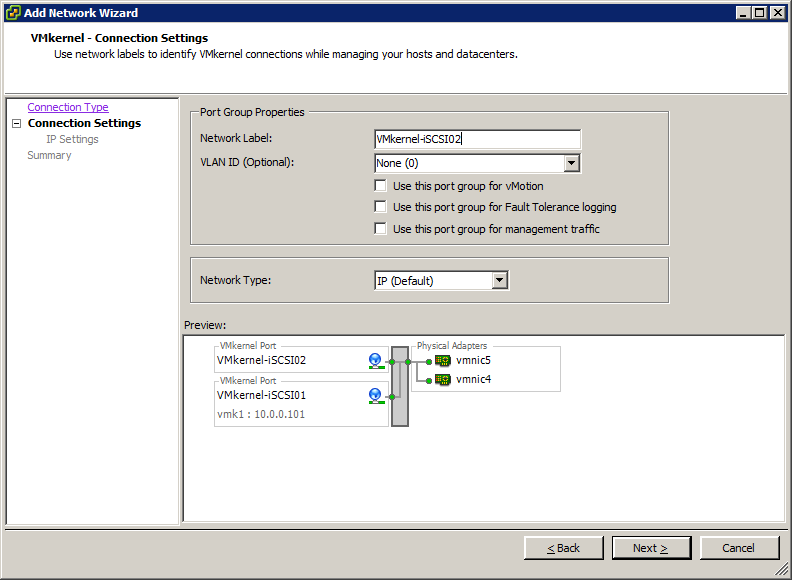 Most VMware admins will prefer a physically separate network, but in the days of 10Gb NICs and a relatively smaller number of interfaces, VLAN separation will work as well. 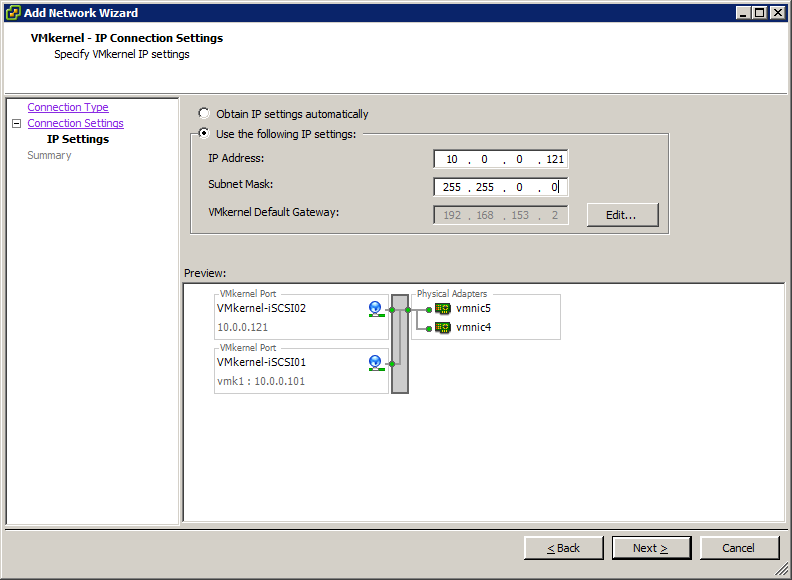 If I have 2 physical uplinks (NICs), I will create 2 VMkernel connections for iSCSI. 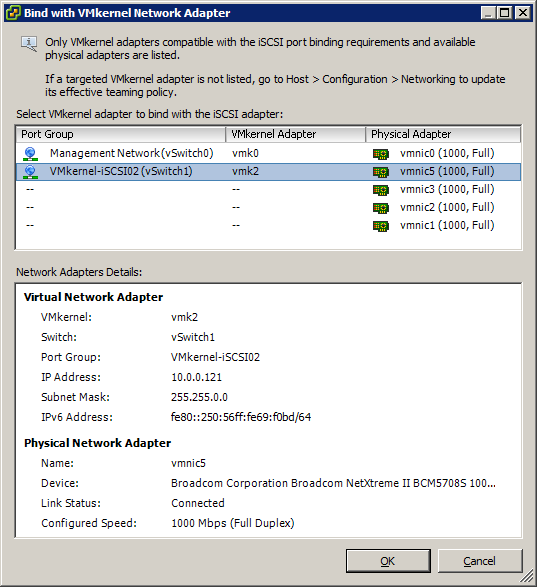 If I have 4 uplinks, I will create 4 VMkernel connections for iSCSI. 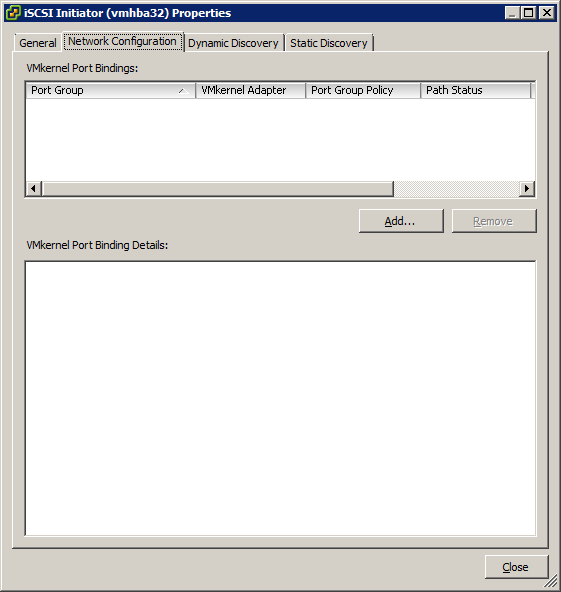 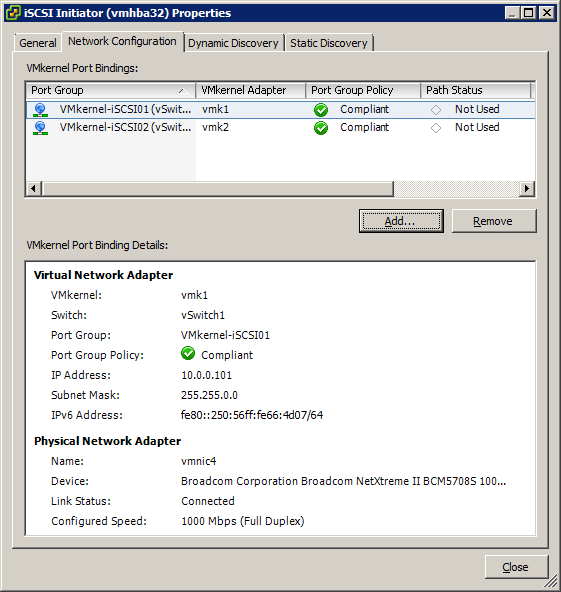 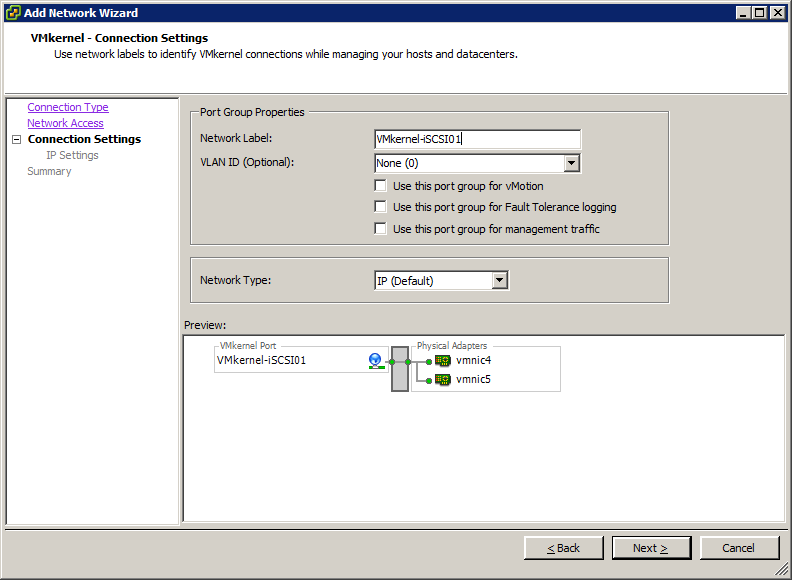 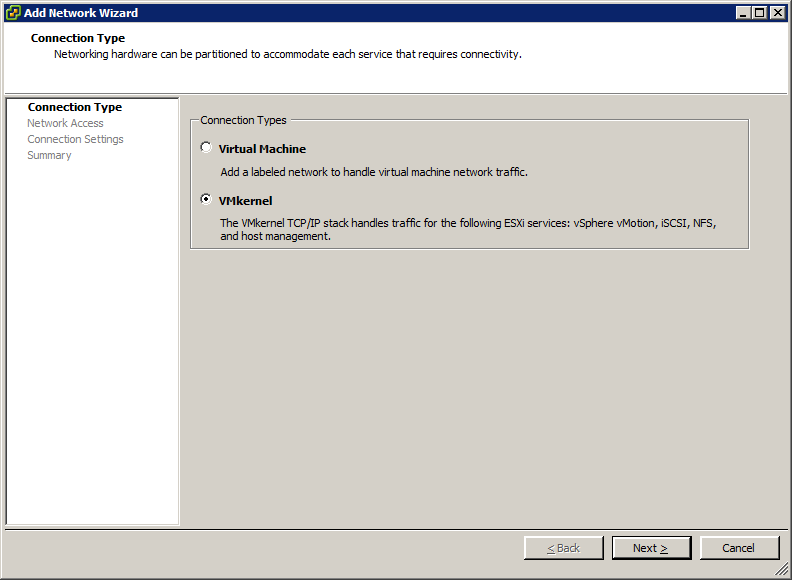 Following this standard for your iSCSI configuration will conform with VMware requirements for Port Binding and assist you in establishing the order in which you bind the VMkernel connections. 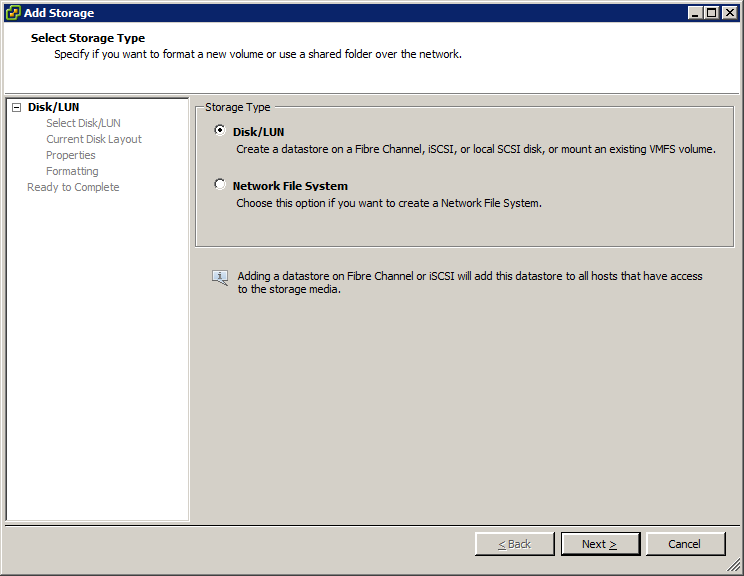 I like to set-up my iSCSI networks with an orderly IP schema. 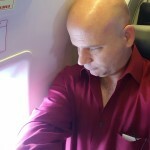 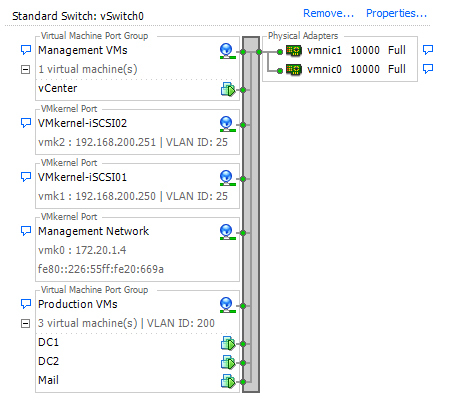 If you were to use a bunch of sequential IP addresses for VMkernel connections, you would leave no room for orderly expansion. 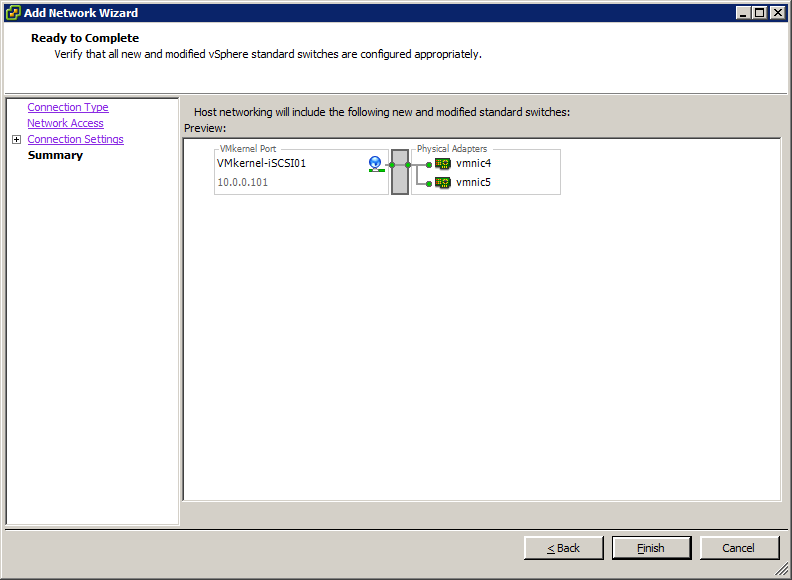 On vSwitch1, click: Properties (be careful, there are separate “Properties” dialogs for each vSwitch and the overall Networking as well! For the network label, choose a name that follows (sequentially) the VMkernel connection you created earlier. 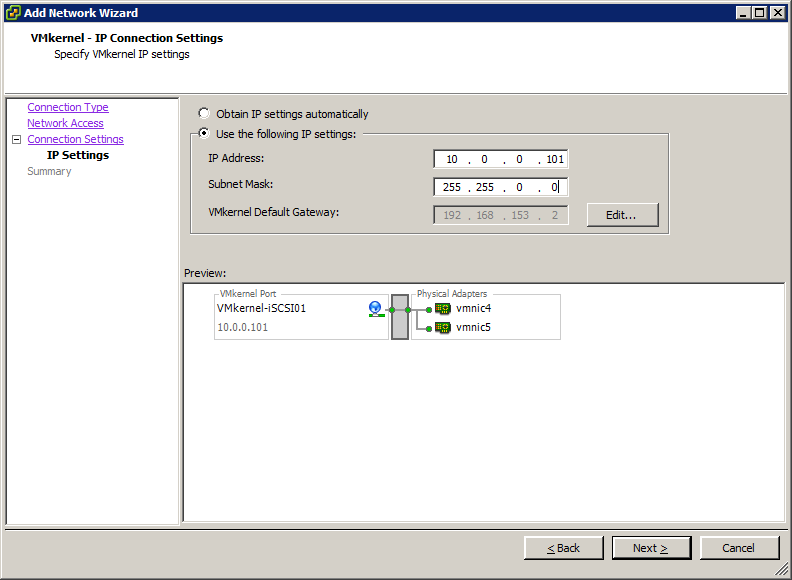 Set an IP that follows the convention you established earlier. 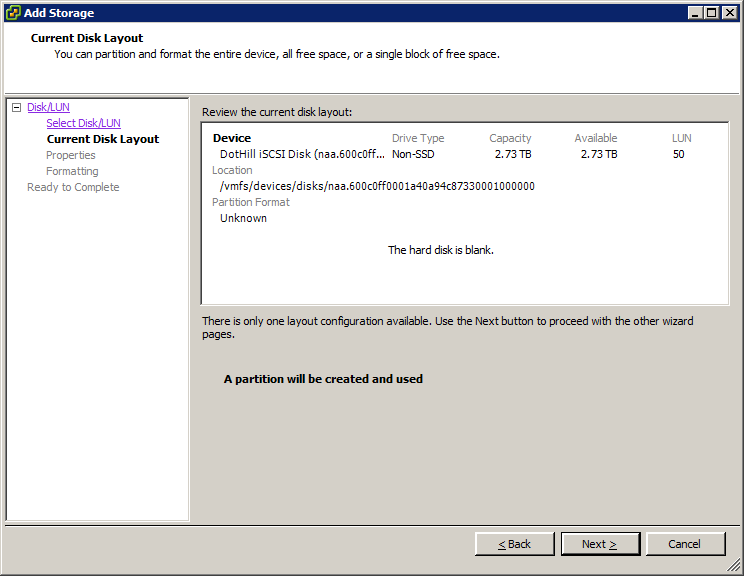 In my case, I am going to increment each VMkernel by 20. 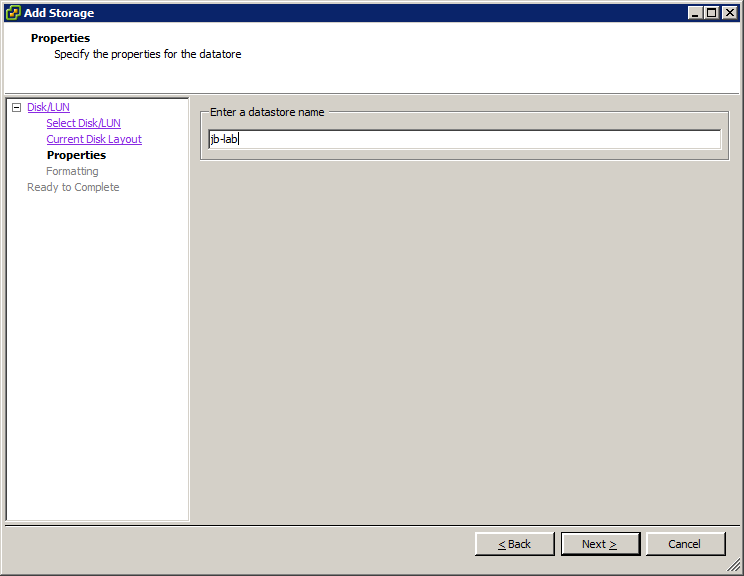 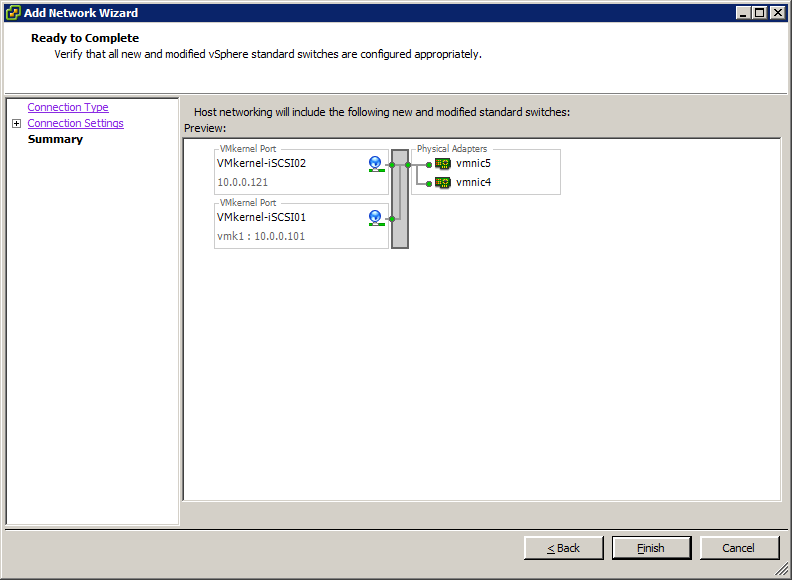 You will now find yourself on the Properties dialog for the vSwitch you created. 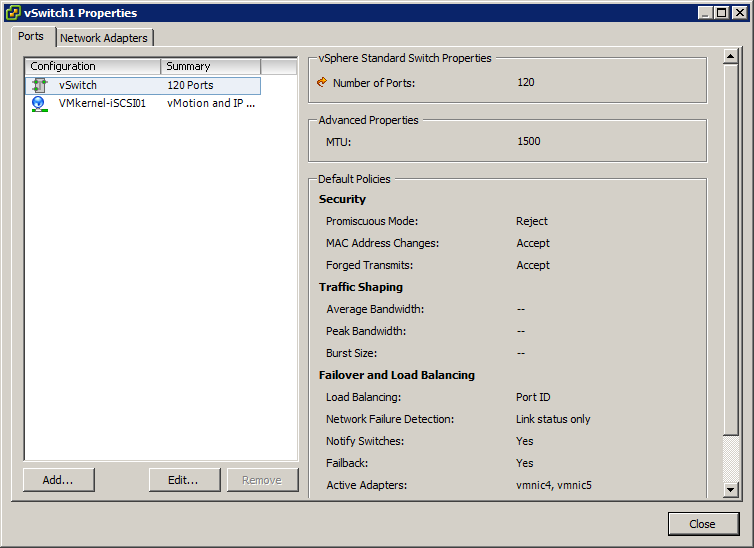 Our goal in this dialog is to remove all aspects of load-balancing and failover from the vSwitch in order to enable Port Binding. 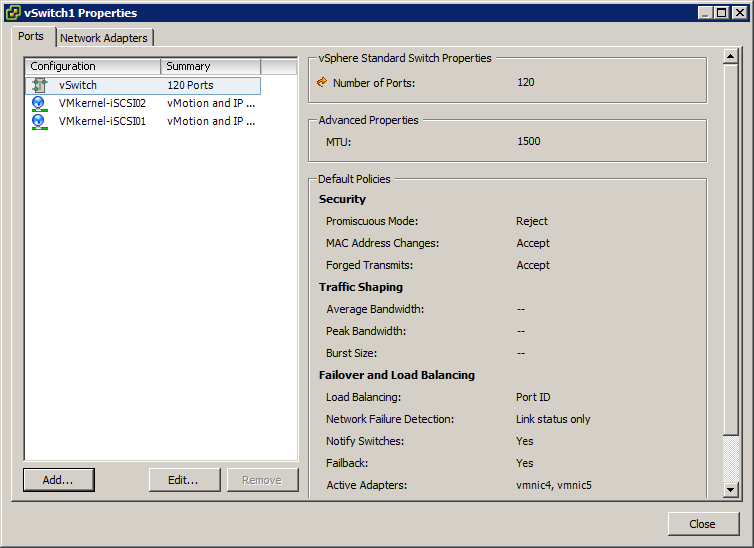 Port Binding will allow the vSphere Path Selection Policy (PSP) to more effectively balance iSCSI loads and implement failover in the event it is required. Since this is the lowest-numbered iSCSI VMkernel, we are going to give it the lowest-numbered vmnic, in this case vmnic4. 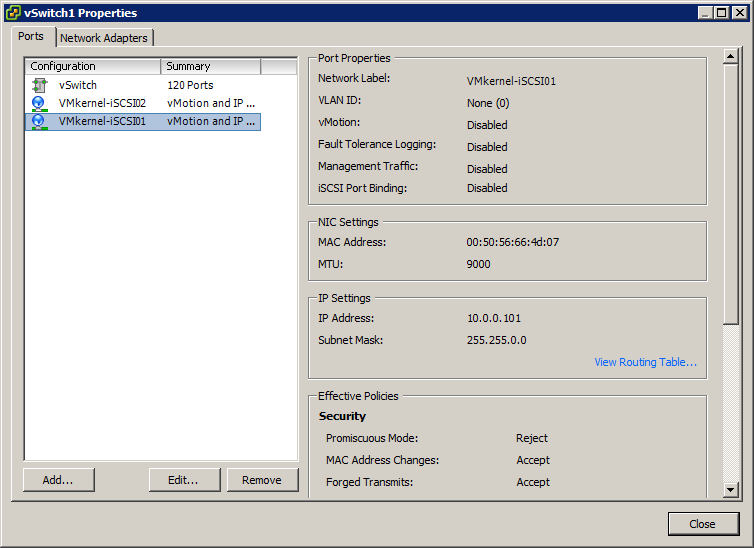 Highlight all other vmnic’s and click the Move Down button until they are all listed in Unused Adapters. 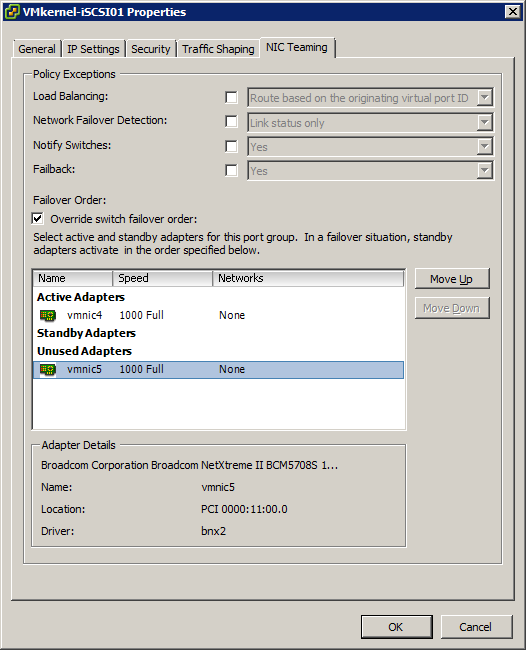 Don’t be tempted to leave any NIC’s in Standby, it will not work, per VMware policy! 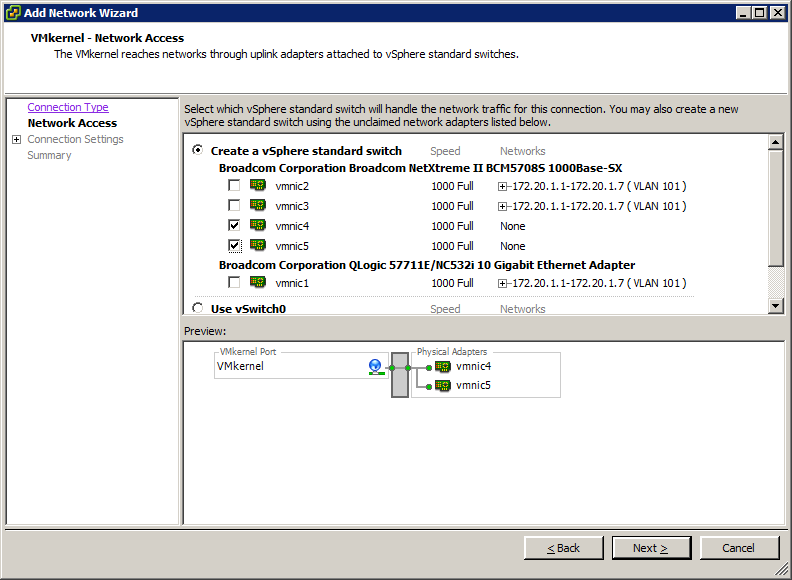 Since this is the next iSCSI VMkernel, we are going to give it the next vmnic, in this case vmnic5. 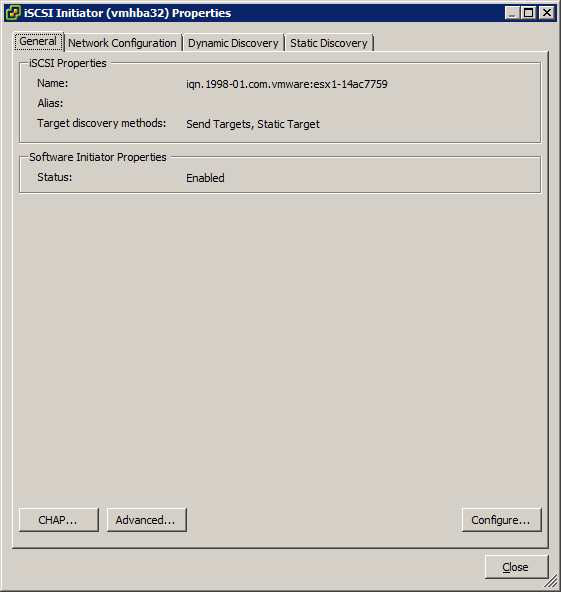 Enter the discovery IP of your SAN. 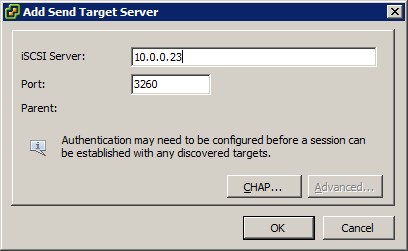 Enter just one address, one time. 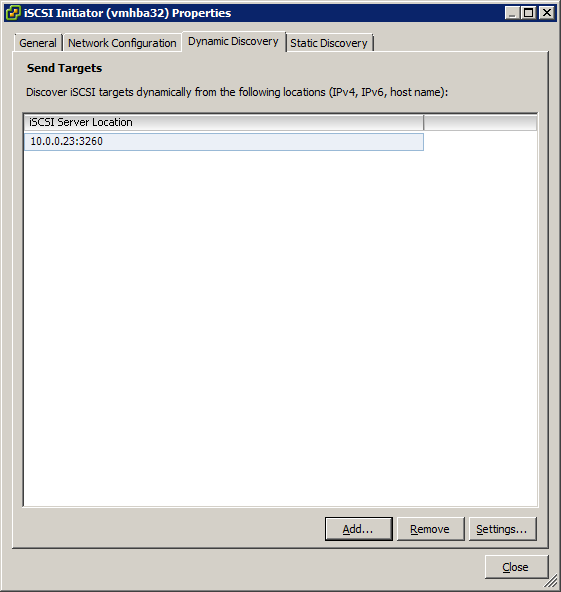 The address will appear after some seconds. 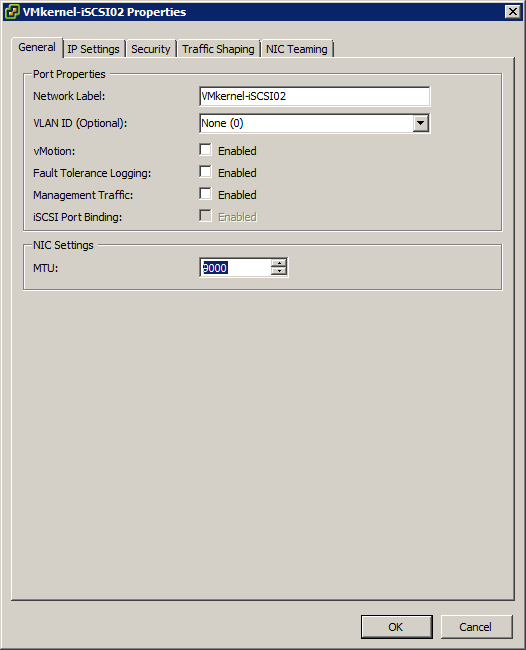 Choose from the available devices (LUN’s) and click: Next. 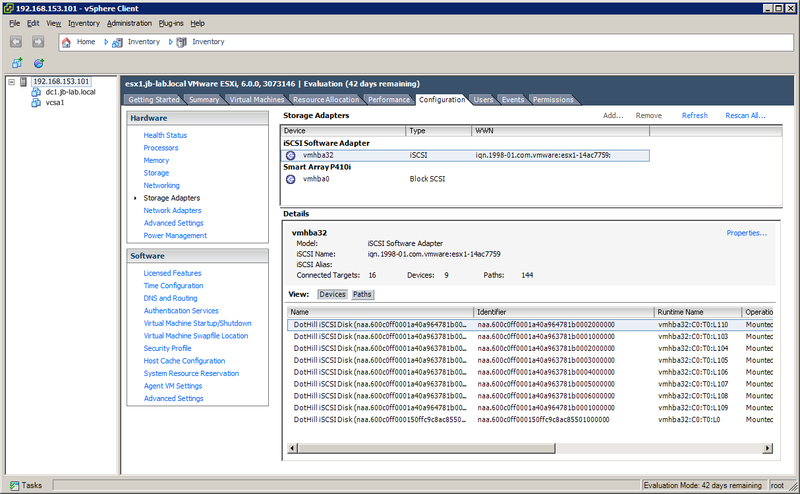 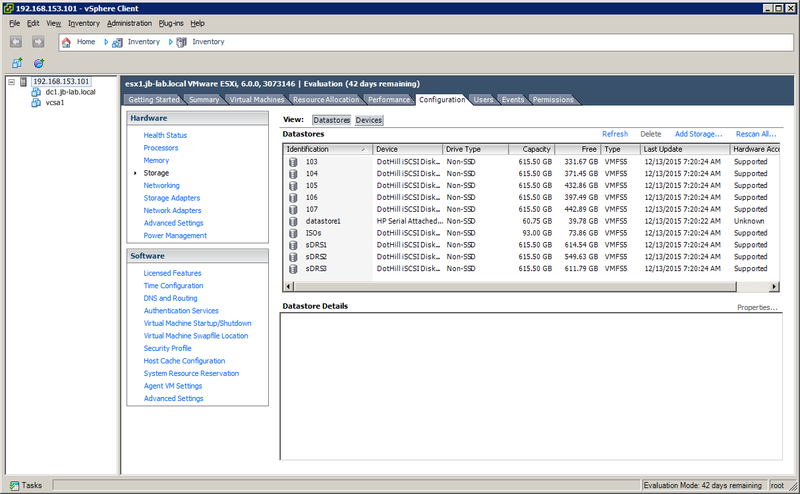 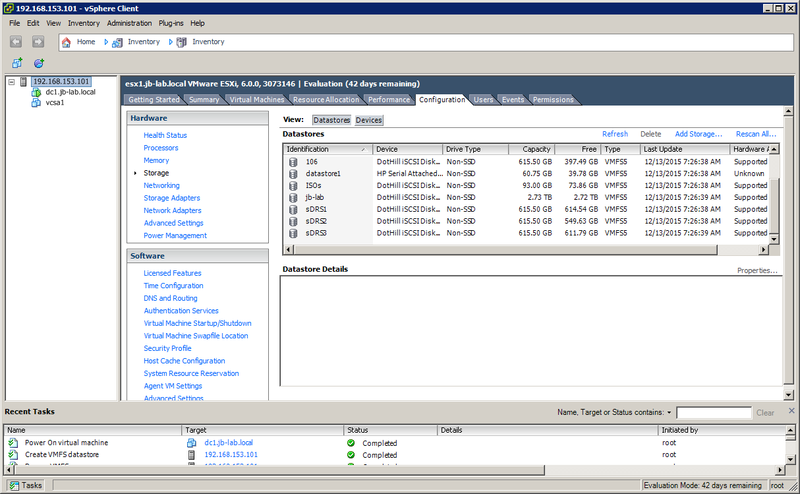 And your new VMFS 5 volume will be created!